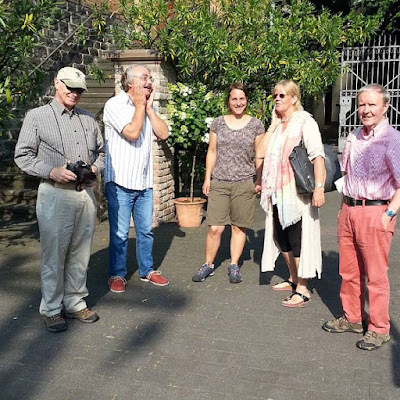 We spent 7 days (Thursday, June 19, 2017 to June 25, 2017) touring 5 German wine regions (Rheingau, Mittelrhein, Ahr, Mosel and Nahe), tasting fabulous wines, meeting world-renowned wine makers, and delving deep into German history and culture. The group was small - there were 4 of us, including Annette and Christian Schiller. This posting provides an overview. More specific postings focusing on individual events will follow (see list below). On the Germany-North Tour 2017 by ombiasy WineTours, we visited a total of 18 wineries in 5 different wine regions: Rheingau, the jewel in the crown, with its perfect, fuller bodied, racy Rieslings; Mittelrhein where the Rieslings grow on the steep slopes of the fortress- and castle-ribboned banks of the Rhine river; Ahr with its sun collecting canyons perfect for the finicky Pinot Noir grape; Mosel with its dizzying steep vineyards and famous elegant Rieslings; Nahe and its serene, peaceful valley where perfect harmonious wines reflect their roots. Germany with its roughly 250,000 acres under vine belongs today to one of the smaller wine producing countries in the world. However, viticulture in Germany has a long tradition, going back to Roman times 2,000 years ago. In the 15th century, the area under vine was four times larger than it is today. Wars, subsequent loss of territory, diseases, overproduction, and competition from beer brewing resulted in land turned over to other agricultural uses. In the 19th century, concentration on terroir and technological progress fostered a tremendous improvement of quality and the prestige of German wines, in particular from the Mosel, Rheingau, and Pfalz regions, resulting in prices above those for first growth Bordeaux wines. Today, all thirteen wine regions in Germany produce outstanding wines, and German Rieslings belong to the best white wines in the world. 09:15 am Departure in Frankfurt am Main. 10:00 am Cellar tour, art-tour, vineyard tour and tasting at Weingut Georg Müller Stiftung (VDP) in Hattenheim, Rheingau. Winemaker and General Manager Tim Lilienström was our host. 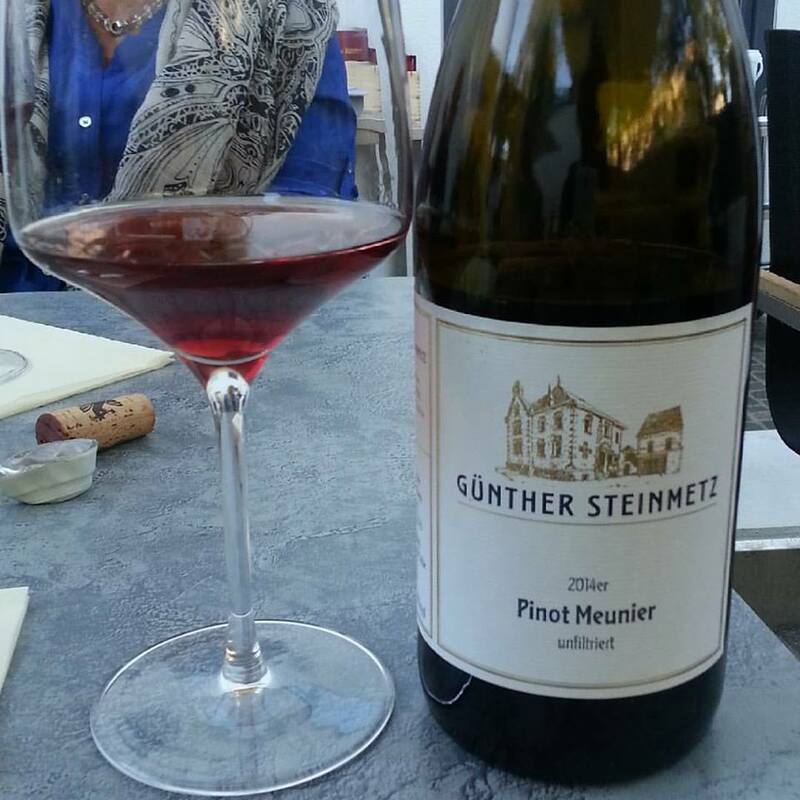 This wine estate in the heart of the Rheingau, the charming town of Hattenheim, was established in 1882 by Georg Müller, co-owner of the famous sparkling wine house Matheus Müller in Eltville. He also was one of the founders of the VDP. In 1913 Georg Müller donated the wine estate to his home town Hattenheim. He transformed it into a foundation (Stiftung), and the profits were used to support the poor and other charitable causes. In 2003 the estate was privatized and Peter Winter, chairman of the board of one of the largest wine companies in the world, purchased the winery. He invested heavily, hired an ambitious cellar master, and brought the estate back to its former glory. The As aficionado of the arts Peter Winter uses the 250 years old vaulted wine cellar as a modern art gallery. The modern art on display and the historic cellar make for an impressive, extraordinary exciting exhibition space. We started the visit with a tour of the winemaking facility, followed by a visit of the art cellar and a sit-down tasting. At the end, on the way to Kloster Eberbach, Tim Lilienström showed us the vineyards of Weingut Georg Müller Stiftung. 12:15 pm Lunch with wine pairing at Eberbach Abbey. One of Europe's best-preserved and important medieval monasteries lies in a valley near the town of Eltville in the Rheingau. Still a world-class winery today, the Eberbach Abbey is a former Cistercian monastery, founded in 1136 by Bernard of Clairvaux as the first Cistercian monastery on the eastern bank of the Rhine river. Its Romanesque and Gothic buildings are very impressive. 01:45 pm Tour at Eberbach Abbey. After lunch we toured the abbey, including a visit of the old monk’s dormitory where every year the famous auction of premium German wines takes place. A very special treat was a peek into the treasure chamber, where century old wine bottles are still stored and where the movie “The Name of the Rose” with Sean Connery was filmed in 1986. 03:00 pm Visit and tasting at Weingut Kloster Eberbach (VDP), Rheingau. We briefly met Managing Director Dieter Greiner. To get the full impression of the importance of the Eberbach Abbey visited the winery. Bernard of Clairvaux founded the winery when he established the Abbey. In medieval times Eberbach Abbey was the largest winery in all of Europe with 750 acres of vineyards. Today Eberbach Abbey is one of the five State-owned wineries (the State of Hesse is its proprietor) and with 500 acres the largest winery in Germany. The estate’s holdings in highly esteemed vineyards in the Hessische Bergstrasse and the Rheingau wine region are unparalleled. We visited the the state of the art, recently constructed new technical facilities of the winery built under the famous Steinberg vineyard just down the road from the Kloster Eberbach. Before visiting the winery, we took a look at the famous Steinberg vineyrad. 04:30 pm Visit and tasting at Weingut Schloss Vollrads (VDP) in Oestrich-Winkel, Rheingau. Schloss Vollrads is one of the oldest wine estates of the world. The impressive tower house, built in 1330, was constructed on the foundation of a roman defense tower. From the early 1300 until 1997 the castle belonged to the Count von Greiffenclau family. The family’s history is deeply rooted in viticulture. According to archives in Mainz they sold wine as early as 1211. Today 200 acres of vineyards, planted 100% with Riesling belong to Schloss Vollrads. Some of the vineyards were already in the possession of the Greiffenclau family in 1300. In 1997 – in view of unsurmountable debts, Count Erwein Matuschka-Greiffenclau committed suicide and since then the Nassauische Bank owns the estate. 06:30 pm Check-in at hotel Schwan in Oestrich-Winkel. Hotel Schwan in Östrich-Winkel is a 3 star historic (built in 1628), newly renovated, meticulously kept family-run hotel in the picturesque wine village of Oestrich. We had dinner in the Wine Tavern Altes Rathaus in walking distance of the hotel. 09:15 am Vineyard tour, cellar visit and tasting at winery Leitz (VDP) in Rüdesheim, Rheingau. Cellar Master Manfred Zuffer was our host. He first showed us the new Weingut Johannes Leitz winemking facilities. We then tasted a few wines in the new tasting room. Manfred then took us on a tour of the famous Grosse Lage vineyards of Johannes Leitz in the Rüdesheimer Berg; during the amazing vineyard tour, we tasted 4 GGs. The Leitz Family’s viticulture history goes back to 1744 and has been passed on from one generation to the next for almost four centuries. 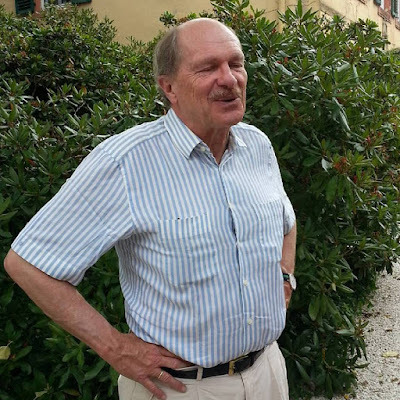 Johannes Leitz, the current owner and winemaker, took charge of the estate in 1985, when he was in his early 20s. At that time, the winery had 7.5 acres of vineyards and was unknown among German wine connoisseurs. Under the leadership of Johannes “Josi” Leitz, the winery grew in size to 100 acres. 99% of his vineyards are planted with Riesling. 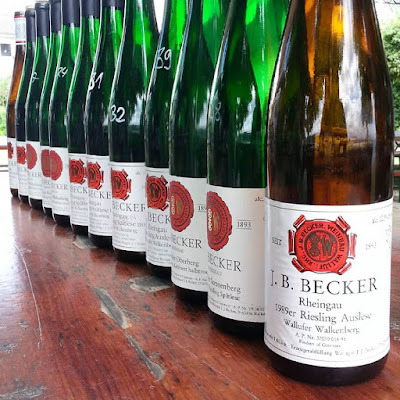 He was able to acquire top Riesling sites in the famous Rüdesheimer Berg vineyards - Berg Schloßberg, Berg Roseneck and Berg Rotland, on the mountain slopes above Rüdesheim facing the south. Unusual for a German winery, Josi exports 90% of his wines with the US being the most important market. 11:45 am Departure and drive to the Mittelrhein wine region. 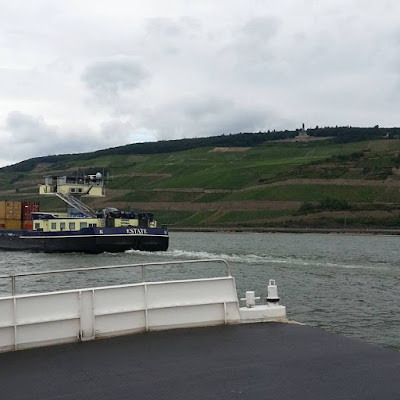 This journey to Bacharach involves a ferry ride across the Rhine river. There is no bridge across the Rhine river for some 70 miles between Mainz and Koblenz to not destroy the beauty of the Rhine valley. 12:45 pm Lunch at restaurant Altes Haus in Bacharach. Bacharach is an incredible beautiful, romantic 1000 year old wine village. Its castles, church spires, medieval city wall, and half-timbered houses on the shore of the Rhine rive is pure “Rheinromantik”. Bacharach is also the birthplace of the world-famous designer Michael Thonet and there is a museum commemorating the famous son. 02:45 pm Vineyard tour and tasting at Weingut Ratzenberger (VDP) in Bacharach, Mittlerhein. 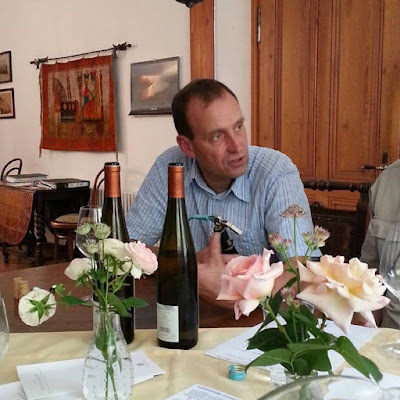 Owner and Winemaker Jochen Ratzenberg was our host. The grandfather of the current owner, Jochen Ratzenberger, purchased this 300 year old wine estate in 1956. It lies in a breathtakingly beautiful narrow valley bordered by extremely steep vineyard sites. The winery is also very beautiful with vast, historic vaulted cellars. A significant portion of the 35 acres of vineyards are planted with vines more than 50 years old, which give the wines substance and at the same time elegance. Jochen Ratzenberger also produces some very delicious Sekt, which is kept on the lees for at least 30 months. 05:15 pm Boarding the boat in Bacharach for a cruise on the Rhine river. 06:50 pm Debarking in Boppard. Check in at the beautiful Belle Époque Hotel Bellevue in Boppard. Hotel Bellevue in Boppard is a 4 star old-world elegant hotel of the Belle Époque era right on the banks of the Rhine river. This hotel dates from the end of the 19th century and has seen the aristocratic visitors from all over Europe when they visited the famous Rhine river. We enjoyed the view on the Rhine river and observed the cargo boats traveling upstream and downstream. right on the banks of the Rhine river. 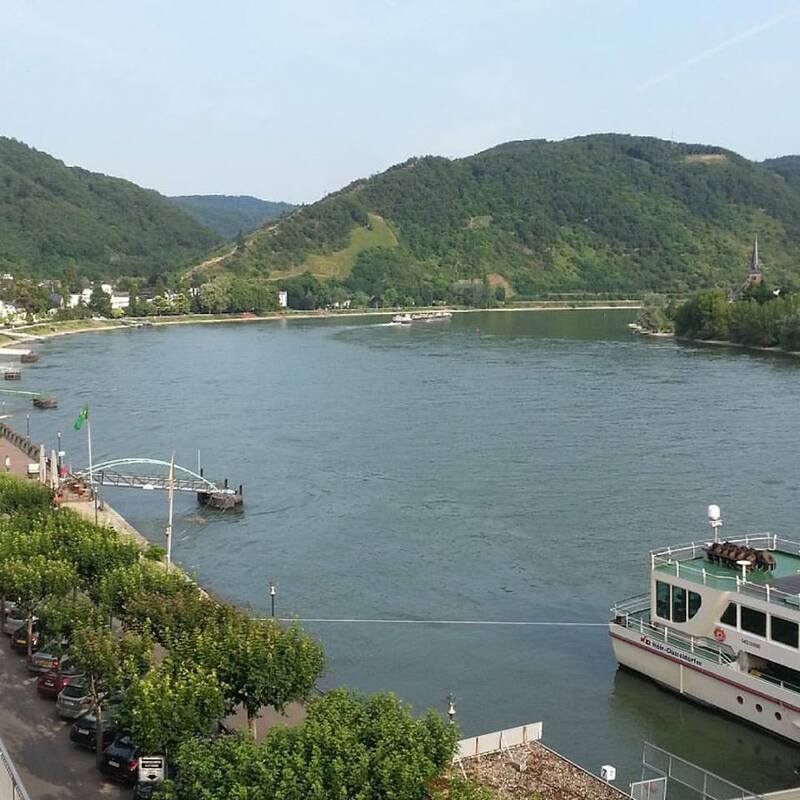 In the evening we strolled along the majestic Rhine river and explored the quaint little town of Boppard. 08:30 am Check-out of hotel and departure. For some 20 kilometers we drove along the beautiful, mighty Rhine river. 09:15 am Cellar tour and tasting at Weingut Heymann-Lösenstein (VDP) in Winningen, Mosel. Owner and Winemaker Richard Löwenstein was our host. Reinhard and Cornelia Heymann-Löwenstein founded this wine estate in 1980. However the Heymann-Löwenstein family can look back on more than 500 years of winemaking. Reinhard is the 13th generation winemaker carrying on the family name. Today the winery has 40 acres under vine, with 98 % Riesling and 2 % Pinot Noir. Reinhard harvests late - at around 160 days of hangtime after flowering – to achieve physiological ripeness of the grapes. 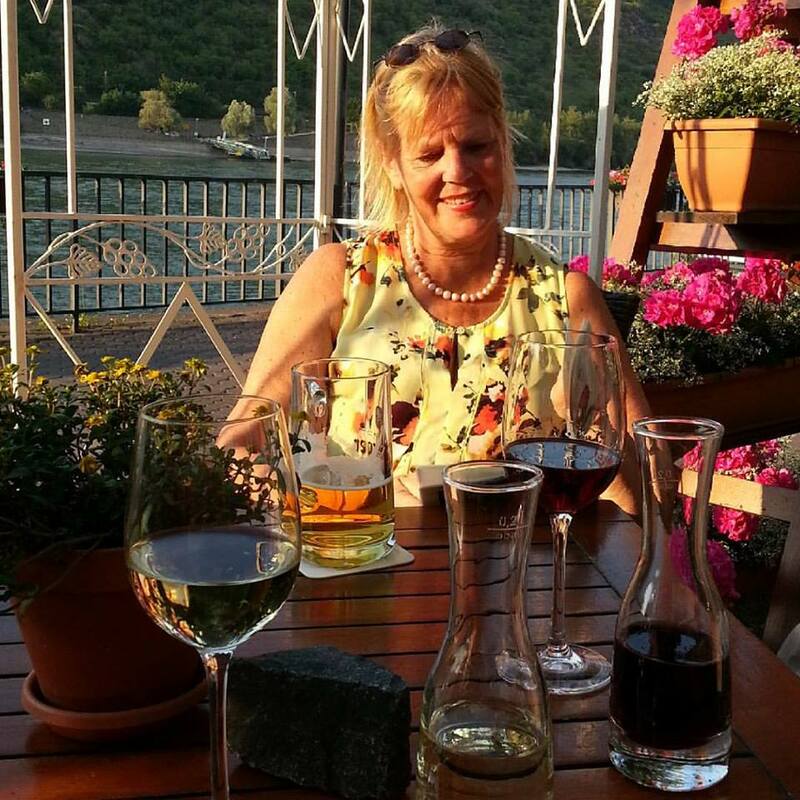 The winery is located in the Lower Mosel, just 15 minutes from Koblenz, where the Mosel river joins the Rhine river. The vineyards of the Lower Mosel are by far the steepest of the Mosel region. Some have an inclination of 60 °. The bewitching slate slopes with terraces have made the Lower Mosel area also known as “Terrassenmosel”. 11:15 am Departure and drive to the Ahr wine region. Weingut Meyer-Näkel is one of the leading red wine producers in Germany. We had lunch at the Gutsschänke (Wine Tavern) Meyer-Näkel. 02:00 pm Tasting at Weingut Kreuzberg (VDP) in Dernau, Ahr. Winemaker Albert Schauman was our host. This winery has long been recognized as one of the top estates for producing great Pinot-Noirs. The Ahr valley north of the 50 °latitude is unquestionable the northernmost region for producing top Pinot-Noirs. The secret lies in an ideal micro-climate found in the narrow canyons along the river with their very special geological conditions, and south-facing slopes. Wine making along the tiny Ahr river goes back to Roman times. The winery Kreuzberg is a young estate by German standards. It was founded in 1953 by the grandfather of the current owner, Ludwig Kreuzberg. However the Kreuzberg family was involved in wine before and active in the local wine cooperative. Today Ludwig Kreuzberg and Frank Josten co-manage the estate, which has grown to cover 12 hectares (9 hectares owned and 3 hectares leased). Since 2013, Albert Schauman is the head winemaker. 2/3s of their vineyards are on steep slopes with a high proportion of Devonian slate; soils that give the Ahr wines their typical character. Owner and winemaker Alexander Stodden was our host. Alexander is the fifth generation of the family to work in the business. Alexander started in the cellar in 2001 and has been in charge since 2006. Berry Bros & Rudd: The Stodden family have been dedicated to producing fine wines in Germany since 1578, a company even older than Berry Bros. & Rudd. The philosophy here is to work in harmony with nature. They have never been a champion of the soft Pinot Noir style usually found in the Ahr, instead favouring ideals that hail from the Cotes de Nuits in Burgundy. Dujac, Ponsot and Roumier are all firm favourites (and friends) of the Stodden family who aim to capture some of this essence, but with a German expression. The winemaking is fairly traditional with longer macerations (4 to 21 days), then fermentation on skins until the right amount of body has been achieved. The wines and lees are then transferred to barriques from the massif Central in France for a minimum of 16 months after the harvest to develop fully. These are bigger wines with breadth, ripeness and structure. 06:00 pm Arrival and check-in at Steigenberger Hotel In Bad Neuenahr. Steigenberger Hotel in Bad Neuenahr is a 4 ½ star hotel that combines the graciousness of the past with modern comforts of today. Excellent spa facilities using the hot springs of the spa town Bad Neuenahr and the location at the Kurpark near the banks of the Ahr river make this hotel very special. The evening was free for us to explore the charming spa town which is famous for its hot springs. 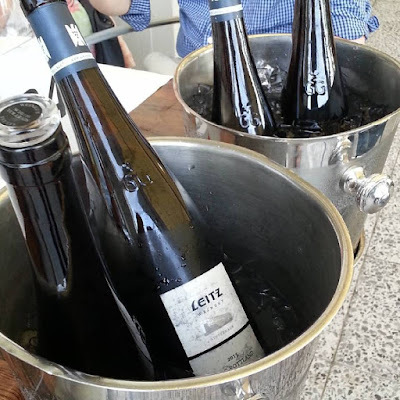 We ended up re-tasting the 4 Weingut Johannes Leitz GGs that we had tasted in the Rüdesheimer Berg a few days ago with Leitz Cellar Master Manfred Zuffer. 10:00 am Tasting at Weingut Markus Molitor in Haus Klosterberg, Mosel. By accident, we bumped into wine giant Armin Diel, Schlossgut Diel, and the up-and-coming Moritz Haidle, Weingut Karl Haidle, at Weingut Markus Molitor. Markus Molitor welcomed us. Katharina Okfen was our host. “80% inclination – 94% Riesling – 100% passion” that is the slogan of Markus Molitor, the Falstaff (Austrian life style magazine) winemaker of the year 2014. Ungrafted vines, some of them more than 100 years old, form the basis for the Molitor incomparable, fine Mosel rieslings. This is quite a large estate with 150 acres of vineyards spread out within the Mosel and Saar valley. Because of the diversity of the slate soils and microclimates of the different vineyard sites, the wines at this estate represent every variety of Mosel wine. Due to the extreme steepness of the vineyard sites and passion for quality, everything is harvested by hand. Harvest is a decisive factor for the quality of the wines. Despite the increased risk, Markus Molitor harvests quite late. This gives the grapes time to ripen physiologically – the most important criterion to develop the optimum balance of the wines with increased extract values and animating acidity. 12:30 pm Lunch at Pizzeria Cappuccino Da Pino in Enkirch, Mosel. 01:30 pm Tasting and Vineyard Visit at Weingut Immich-Batterieberg in Enkirch, Mosel. For two decades this wine estate was a sleeping beauty. In 2009 two families from Hamburg bought the estate, invested heavily, and hired Gernot Kollmann, who converted the winery into one of the top estates in the Mosel valley with passion and relentless energy. The winery looks back on a history of 600 years, and therefore belongs to one of the oldest in the Mosel region. It was founded in 1425 by the Immich family. In 1841 Carl August Immich created the vineyard site Batterieberg (artillery mountain) by using dynamite to blow up the mountain site to form the perfect south-facing slopes with the perfect inclination – hence the name. The vineyards are planted 100% with Riesling and in the, and most vines are more than 60 years old. In view of the extremely steep vineyards all sites are planted in single pole method. Gernot prefers spontaneous fermentation, and in general the “hands off” approach. On the way from Weingut Immich-Batterieberg in Enkirch, Mosel. to Weingut Fritz Haag (VDP) in Brauneberg, Mosel, we passed by the new Mosel Bridge which is being constructed. We already had a good view of the bridge from Weingut Markus Molitor. 04:15 pm Tasting and Vineyard Walk at Weingut Fritz Haag (VDP) in Brauneberg, Mosel. Owner and Winemaker Oliver Haag was our host.We briefly met Wilhelm Haag. The world-renowned wine estate Fritz Haag lies in the heart of the middle Mosel. It looks back on a 400 year old history. 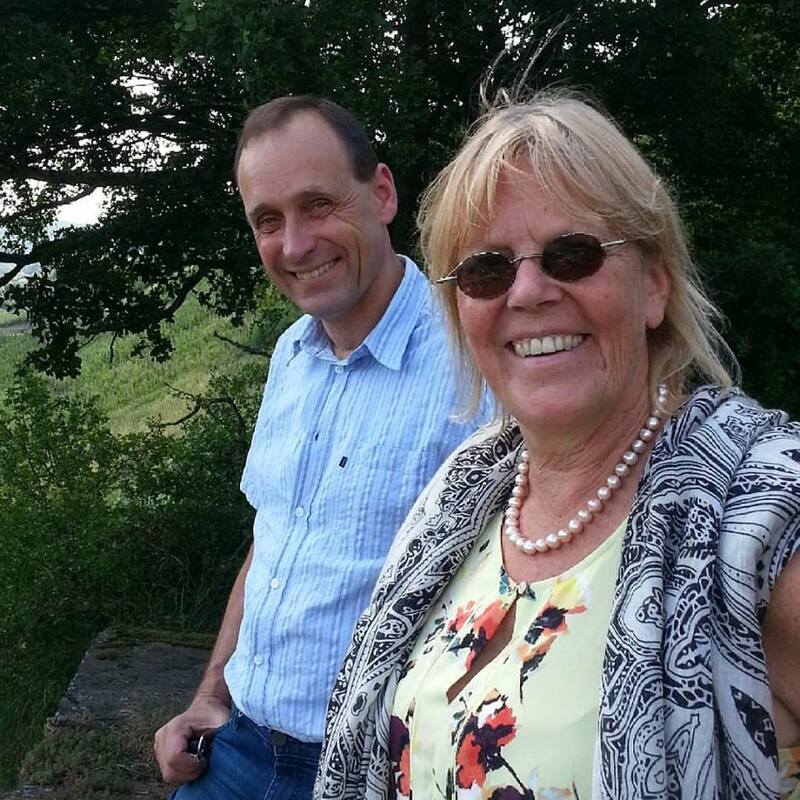 Since 2005 Oliver Haag, together with his wife Jessica, is responsible for the estate. 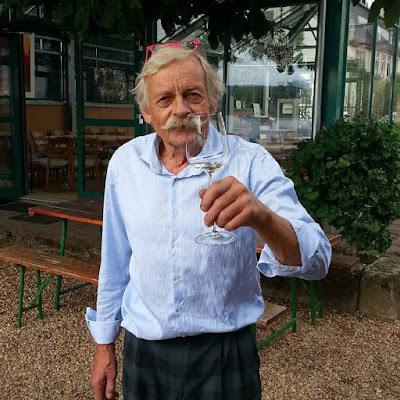 He trained and worked with the best of the best in Germany, such as Helmut Dönnhoff, Bernhard Breuer, and graduated from the Geisenheim oenological university. Oliver Haag continues the philosophy of his father Wilhem Haag, which is the production of fine, fruity, delicate Mosel Rieslings of unmistakable character. 06:30 pm Arrival and check-in at hotel Schanz in Piesport, Mosel. Hotel Schanz in Piesport is a 3 star family run beautiful, modern hotel with a 2 Michelin star restaurant on the premises. The Schanz family in Piesport are winemakers. Besides their winery they also opened a small guesthouse and a wine tavern. In the meantime the guesthouse became a modern, state of the art hotel, and the tavern a 2 Michelin star restaurant. Son Thomas Schanz had ambitions. He trained with top 3 Michelin star chefs and soon enough he received his first Michelin star. In 2016 he was awarded the second Michelin star. 09:45 am Cellar Tour, vineyard tour and tasting at Weingut Maximin Grünhaus (VDP) in Mertersdorf, Ruwer, Mosel. Owner Dr. Carl von Schubert was our host. The Maximin Grünhaus estate lies at the foot of a long steep south-facing slope on the left bank of the Ruwer river, a tributary of the Mosel river. There is evidence that the Grünhaus was already densly populated during Roman times. In the 7th century the estate was given to the Benedictine monastery of Saint Maximin in Trier. Until the end of the 18th century - when Napoleon secularized all church property - the estate was managed by the Abbey of Saint Maximin. Until 1810 it was held under French administration by the revol. After that time the estate was privatized. It was purchased by the current owner family in 1882. Dr. Carl von Schubert, fifth generation of the family, and son Maximin von Schubert, 6th generation, are the current owners. Carl von Schubert’s doctoral thesis examined the economy of viticulture on steep slopes. The 80 acres of vineyards are planted 90% with Riesling, the rest with Pinot Blanc and Pinot Noir. Viticulture is predominantly organic, the vineyards are planted with a cover crop of wild herbs and grasses, no pesticides or herbicides are used. Yields are restricted to around 45 - 55 hectolitres to ensure top quality. 12:30 pm Lunch at restaurant / hotel Klostermühle in Ockfen, Saar. 02:15 pm Vineyard visit, cellar tour and tasting at Weingut von Hövel (VDP) in Oberemmel, Saar, Mosel. Owner and Winemaker Max von Kunow as our host. 04:30 pm Arrival and check-in at the Mercure Hotel Porta Nigra in Trier. The Mercure Hotel Trier Porta Nigra ia 4-star hotel with a great view of the Porta Niegra. 05:15 pm Guided visit of the Amphiteatre and the Roman Baths "Kaiserthermen" in Trier. In the evening we went to the Weinhaus, which has a huge selection of wines from the Mosel at ex-winery prices plus a corkage fee of $10. On the way back, we stopped at the wine taverns of the Weingut Friedrich Wilhelm Gymnasium and Weingut Reichsgraf von Kesselstatt. 08:30 am Check-out of hotel and drive to the Nahe wine region. 10:30 am Tasting at Weingut Emrich-Schoenleber (VDP) in Monzingen, Nahe. Frank Schönleber was our host. 01:30 pm Wine pairing lunch at restaurant Landgasthof Zur Traube in Meddersheim, Nahe with Petra Hexamer and the wines of Weingut Hexamer. This restaurant is a hidden gem in the Nahe valley. For more than a decade Chef Herbert Langendorf was a one Michelin star chef with the Ente vom Lehel in Wiesbaden. In 1998 he and his wife Ingrid opened the Landgasthof Zur Traube in Meddersheim. The outstanding Winery Hexamer is just across the street and we will be joined by Harald or Petra Hexamer who will chose their wines to match the menu. Weingut Hexamer is a family-owned and run winery in Meddersheim in the Nahe region. The vineyard area totals 23 hectares in Meddersheim, Schlossböckelheim and Sobernheim, with Riesling accounting for 60 percent. The family name, Hexamer, dates back centuries in Germany and has a history of winemaking; however, it was not until the late 1990’s when the Hexamer family began producing commercially, i.e. when Harald Hexamer and his wife Petra took over. Harald Hexamer is convinced that the key to making top wines is the work in the vineyard. Accordingly, Harald Hexamer’s meticulous work in the vineyard is marked by pruning to control yields (“often six to eight bunches per wine”) and hand-harvesting. The grapes are picked exclusively by hand and fermented very cold (below 12 degrees Celsius) with cooling utilized only when necessary – “but we often pick so late we bring naturally cold fruit — below 10 degrees — back to the winery.” Hexamer handles the wine as little as possible: no dosage is used, inoculations are made only with native yeasts, and all wines are whole-cluster pressed. 95% of all Rieslings at Hexamer are made in stainless steel and racked only once, three to six weeks after fermentation is complete. Weingut Kruger-Rumpf has 5 rooms that it rents out. 7:00 Cellar tour at Weingut Kruger-Rump in (VDP) in Münster-Sarmsheim, Nahe. Following check-in and before dinner, Stefan Rumpf gave us a quick winery tour. We then moved to the restaurant. For dinner, we were joined by American wine experts. Georg, Stefan und Cornelia Rumpf were our hosts. Georg Rumpf had returned from an USA sales trip this moring. The next moring, Georg Rumpf joined us for breakfast. 09:30 am Check-out of hotel and departure. We had to cross the Rhine River again. Hajo Becker was our host. His wive Eva Becker and his sister Maria Becker welcomed us. It is a paradox: In the wine scene, Hajo Becker is sometimes dismissed as old-fashioned winery, but a community of young, dynamic sommeliers and retailers adore his wines. For them, his wines belong to the most original wines in Germany – and they are right. Hajo Becker is a traditionalist - in comparison with many colleagues in the Rheingau, who run after each wine-cellar fashion. One of his most important resource is time. His Rieslings all remain a whole year in old oak barrels on the lees, which is neither nostalgia nor wanted, but simply his method. So they mature into a great harmony, regardless whether the vintage is rather lush and rich in alcohol or lean and acidic. The Becker wines are delicate and subtle. They always improve through aging in the bottle. We had our last meal at Gutsausschank-Ristorante Weingut von Oetinger. It is part of Weingut Achim von Oetinger, run by the Contino family and serves tradtional Italian food. We had a few glasses of von Oetinger Riesling and winemaker/ owner Achim von Oetinger joined us breifly to welcome us. 03:15 pm Arrival at Frankfurt International Airport. Wine-pairing Lunch at Landgasthof Zur Traube in Meddersheim, Nahe, with Petra Hexamer and the wines of Weingut Hexamer.